View from space of Turrell’s Roden Crater in Flagstaff, Arizona. The artist in a work similar to one planned for Mass MoCA. The former water tank will be converted into a Turrell piece. 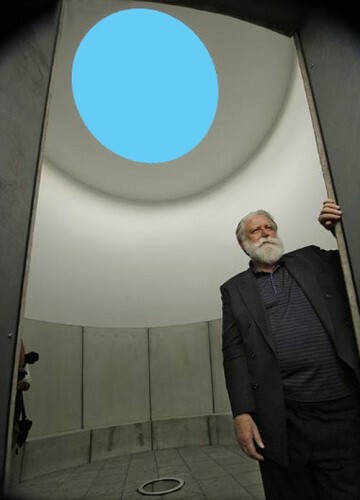 As a teenager James Turrell (born May 6, 1943) obtained a pilot’s license. For a time it provided a means of employment. It later became an element of his work. In 1979, while flying over Arizona he discovered and ultimately purchased Roden Crater, an extinct volcano in the desert near Flagstaff. With $15 million from the Lannan Foundation he began transforming it into a massive celestial observatory. Still in progress, this monumental undertaking will frame astrological phenomena for the naked eye by manipulating interactions of light and space within and beyond the crater. While there is no incentive to visit Flagstaff, the artist’s home and location of the Roden Crater, Mass MoCA is developing some 32,000 square feet devoted to his work. When completed, including a converted water tower reconfigured as one of his “Skyspace” observatories, nine works will be on view for 25 years. Whether the installations are extended after that will be up to the next generation of MoCA’s administration and board of directors. The projected installation will occupy approximately the same space as 2013’s James Turrrel: A Retrospetive. Participating museums included the Los Angeles County Museum of Art, the Solomon R. Guggenheim Museum, New York and The Museum of Fine Arts, Houston. 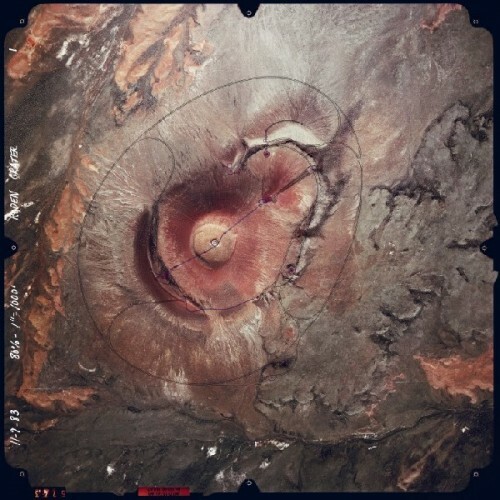 The exhibition surveyed from his Mendota studio days in Santa Monica to designs for the Roden Crater. There were projected shapes on a flat wall and into the corner of a gallery space. In a Los Angeles Times review Christopher Knight commented provocatively that “Light, the essential ingredient for sight, is Turrell's principal medium. Spiritual perception is his art's aim. The ancient metaphor of light as the engine of enlightenment is conjured in a modern way. As Ralph Waldo Emerson stated "I become a transparent eyeball. I am nothing; I see all; the currents of the Universal Being circulate through me — I am part or particle of God." Asking viewers to "go inside and greet the light" evokes Turrell’s Quaker upbringing. The work has been influenced by life experiences with aviation, science, and psychology. The artist began using light as a sculptural medium in 1966, controlling its passage through the windows of his Santa Monica studio to create illusions of weight and volume. Between 1968 and 1969, Turrell participated in the Los Angeles County Museum of Art’s ‘Art and Technology’ program and collaborated with artist Robert Irwin and psychologist Dr. Edward Wortz of the Garrett Aerospace Corporation on experiments with a Ganzfeld chamber, a space which eliminated all aural and visual stimulation. His work later evolved into more carefully calibrated light projections and environments which produced profound visual and sensory effects for viewers — illusions of three-dimensional floating forms, unmodulated fields of color, and an utter lack of architectural edges or any other form of spatial orientation. Encountering these Ganzfeld chambers can evoke a daunting range of physical and emotional responses. Standing before one of these large works at the Whitney Museum, like a Doubting Thomas, it was impossible not to stick a finger in the side of the work. It was shocking and transformative to find that what appeared to be a solid plane was indeed a void. The experiment involving physical contact with the work confirmed perceptions not possible with the naked eye. If you allow for the full dimension of the experience there are dialogues between notions of illusion and reality. It makes one aware that only a fraction of all matter is visible just as the human ear is limited to a narrow range of sound. While Man is the Measure of All Things artists like Turrell make us aware of our limitations as instruments of perception. The series of Skyspaces which have been created in numerous incarnations invite us into a chamber to have a common experience of observing an oculus of open sky. Of course the Pantheon in Rome predates Turrell. The monumental version of this phenomenon is the Roden Crater. A friend who visited the crater early on and on several occasions since then relates that the experience is astonishing and exquisite. There will be an intimate, scaled down variation in MoCA’s altered water tower. The impact will be most dramatic at dawn and dusk just like the solstice events at Stonehenge and Newgrange which inspired the artist. It was announced that the artist would attend the MoCA event. He planned to fly in from Flagstaff but inclement weather cancelled that. Joe Thompson, who is also a pilot, discussed the terrible conditions with Turrell while I spoke briefly with the artist by cell phone. The connection was made by an associate of the artist. Given the noise level during the press conference, and the poor quality of a taped communication, we were able to decipher only fragments of the conversation. I asked him about the spirituality of light from the Surah on Light in the Koran, to the Neolithic monuments and windows of Gothic cathedrals. “It connects the material and the immaterial. People talk about Paul on the Road to Damascus. They speak of light as enlightenment. The actual experience of light. It’s a matter of how we treat and use light. Light is about revealing something about another object” he said. Thompson told me that Turrell has visited MoCA on a number of occasions starting in the 1980s. Seeing the LeWitt building was particularly influential in his decision to cooperate on the Phase Three development. Last summer during the opening of the Tadao Ando designed Clark Art Institute the director Michael Conforti mentioned artists exploring possibilities of site specific works. “The (Canadian) artist Janet Cardiff is visiting right now exploring the possibilities of creating sound sculptures... James Turrell is coming but I doubt that we can afford what he will propose” he said. At a later time I asked Clark curator David Breslin about those visits. Mirroring Conforti’s comments he explained that the Clark is not interested in becoming a sculpture park but is exploring judicious collaborations. 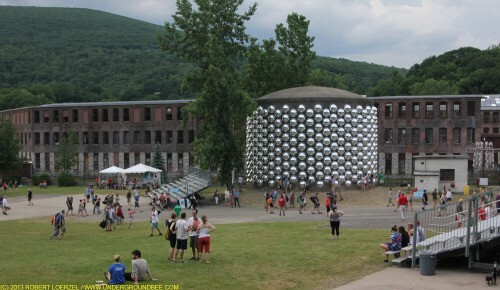 Conforti insisted that such an undertaking will be more appropriate to Mass MoCA. To some extent that is now happening. The plans for long term displays of works by Jenny Holzer include placing her text inscribed marble benches, LED sculptures and projections in strategic spots on the MoCA campus. It has long been speculated that MoCA would expand its reach into the city with works beyond the 16 acre footprint of the main campus. A recent news report about developing adjacent Heritage Park as an interface between MoCA and the city included the possibility of a Daniel Buren piece. In the past few years under the direction of Jonathan Secor, an arts administrator who recently vacated that position at MCLA, a number of murals have been created around the city. Some are of questionable quality and not up to MoCA's world class standards. An exception is a bus stop shelter on Main Street commissioned by MoCA. The city is in the process of forming an arts commission which will oversee future public art projects. There is enormous potential for inspired collaborations that will lure visitors beyond Mass MoCA and into the stagnant and struggling downtown business area. During the press conference I asked Thompson if there is an update on a Turrell project for the Clark? From the back of the room Conforti replied that nothing is confirmed. There have been ongoing dialogues between Thompson and Conforti on ways to connect the dots between their museums. We keep nudging them about when the MoCA building leased by the Clark will be developed. It’s just a matter of time before we see the Clark/ MoCA building and hopefully a Clark site specific work by Turrell. When you wish upon a star/ Makes no difference who you are/ Anything your heart desires/ Will come to you.